When it comes to website navigation, little details make a huge impact on your traffic. For utility websites specifically, there's a strong need for users to be able to find the information they’re looking for easily. Why? Because there's often pressure or frustration associated with paying their utility bill or solving a problem they came to the website for. And if visitors go to your website only to find a lack of clarity or misleading links, they'll immediately look elsewhere or call to complain. One way to assure your customers are satisfied with your utility website is by analyzing your website's navigation. Follow where the users are going when they’re on the site by asking, “Where are users dropping off?” or “What could be confusing to them?” or “What’s stopping them from continuing their search?” Once you answer these questions, you’ll have a better understanding of where you can make improvements. So, is your site navigation lit? We're here to help you answer that. Read on to see the questions you should ask yourself when analyzing your website's navigation. Are the main sections of my website visible and easy to find? The main sections of your website should contain the most important and useful information that users need access to. 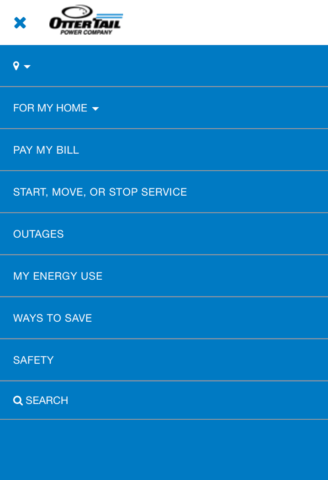 For your utility website, it's necessary that the user can find out how to pay their bill, start or stop services, or know what to do in case of emergency. Here, we've added an example of what the main sections of your website should look like. 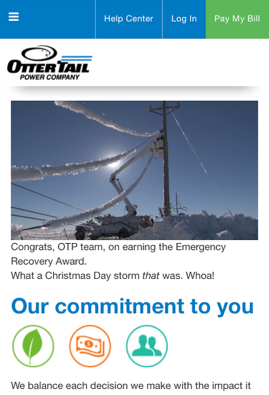 For Ottertail Power Company, we've made the "Pay My Bill" section front and center so there's little to no searching required to make a payment. It's important to note that the first few sections will be more easily remembered than ones to follow. Are my menu labels too long or too vague? The navigation bar is a key place to indicate relevance to search engines since it appears on every page. Here we added specific keywords as labels so Google and audiences know exactly what the company is about. Sometimes, "products" or "services" can be too vague because those words are rarely searched for. However, if someone were to search "outages" or "pay my bill," search engines will be able to take users directly to where they need to be. The navigation bar is one of the more prominent features on the page that users notice, so it's necessary to provide clear indicators about where they're being navigated to. Have I limited the amount of menu items? Fewer items in your navigation will allow visitors to remember and process your information. If there's too much information, users will scan past the key points. With your utilities website, chunking your items together makes it easier for visitors to process the information. Here we have an example of how we displayed information on Nemont's website. We decided to combine information under specific categories on the home page. When you scroll over the section, a menu with specific items shows up. This is a helpful way to organize useful information. We also made sure to limit the number of items on the drop down menu to keep from overwhelming users. If you have more than ten options in your menu, you should consider eliminating some of them or combining them into other sections. Can my users see how they got to the page they're viewing? Leaving breadcrumbs so visitors can see where they are is necessary for impressive navigation on your website. 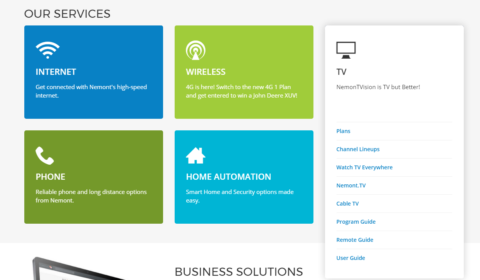 Below is an example of Nemont's site navigation. As you can see, you can follow along with the breadcrumbs on the upper right of the page as you explore the website. This makes it easier to find where you need to go instead of having to go home and start from the beginning each time you need to find something. From simple menu options to leaving breadcrumbs, if you answered no to any of these questions, you may need to make some updates to your utility website (let us help!). If you answered yes to every question, get excited: your site navigation is lit.